Pissarro moved back to the town of Pontoise, twenty miles Northwest of Paris, in August, 1872. He had spent 1870–71—a politically turbulent year in France—abroad in London. There he had encountered the paintings of John Constable, an early-nineteenth-century landscapist, whose sensitive portrayals of clouds likely inspired the overcast sky in this picture. Pissarro’s first autumn back in Pontoise was among the most productive periods of his career; he turned out twenty-seven views of the town and its inhabitants. Here, with remarkable concision, he evoked a newly-built boulevard, its sidewalks lined with young trees, its gutters filled with fallen leaves. It is autumn on this small, tree-lined street outside of Paris. Leaves tinged with gold and orange are silhouetted against an overcast sky. The dark, rhythmic lines of the tree trunks create a strong vertical thrust, while branches at the upper right seem lively and free. On this cold fall day leaves rustle, and the women wrap themselves in heavy shawls. 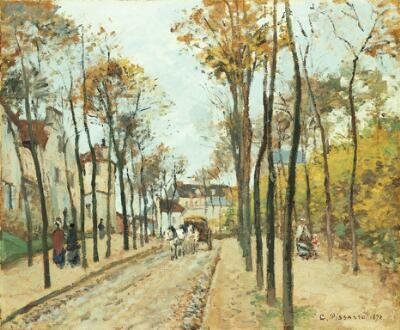 This small canvas of the Boulevard des Fosses, or boulevard of the moats, was painted by Camille Pissarro in the town of Pontoise, in the fall of 1872. The street had been built only ten years earlier, over moats that had fortified the city in the Middle Ages. Large houses and fashionable pedestrians suggest a well-to-do neighborhood. Born in St. Thomas in the West Indies to merchant parents, Pissarro came to France in 1855 to study painting. He lived in Pontoise, on and off, for nearly twenty years, painting along its quiet suburban streets, its busy markets, and the banks of the Oise River.